It's rhubarb season, and there is nothing quite like 'fresh from the garden' rhubarb pie at this time of the year. 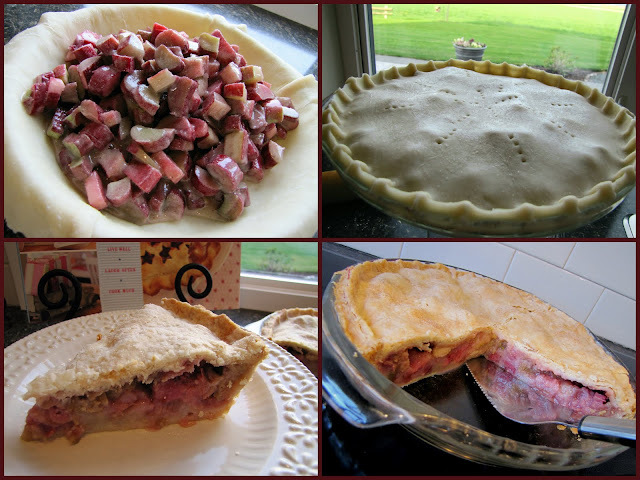 A few rhubarb pies have already come and gone from my kitchen this spring. Here it is...my mom's rhubarb pie. Roll pastry to line 9-10 inch pie plate. Roll out top crust and set aside. In large bowl...combine eggs, sugar, flour and nutmeg until well blended. Add chopped rhubarb and stir to mix. Trim and crimp edge to seal. Pierce top crust with fork to vent. Bake at 400°F for 15 minutes. Reduce heat to 35o°F and continue to bake for another 40 minutes...or until filling is bubbling and rhubarb is tender. A winning combination is nutmeg and rhubarb...so perfect together! Remember growing up with Rhubarb pie, Rhubarb crunch and wild blueberry pie!! No more wild Rhubarb in the yard, need to go to the store!! Pie looks great and oh so yummy!! My mother used tapioca as the thickener in her rhubarb pie and I always enjoyed reaching that layer where there was a little gelatinous mixture of sweet and tart! I just made a rhubarb upside-down cake by subbing pineapple with chopped raw rhubarb. It was fantastic! Ahhh. You bring back sweet memories. My mom never made rhubarb pie so I assumed I didn't like rhubarb pie, I mean rhubarb is a vegetable right? 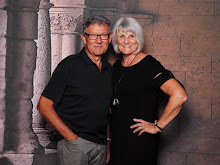 When I started dating my husband (many years ago!) we went to his grandmother's for lunch after church one day and I was served a huge slice of, you guessed it, rhubarb pie. Well, since my mama raised me right I smiled, took a deep breath and proceeded to try to choke down the piece of pie. I remember with that first bite thinking "this is delicious." I have loved rhubarb ever since. My husband's grandmother has been in heaven for many years but I still think of her every time I eat rhubarb pie. Rhubarb season is here. And rhubarb pie! Thanks for the recipe. Memories of rhubarb. When we were kids ( a long time ago), we'd camp out in the back yard at night and sneak into the neighbor's garden and grab some rhubarb, return to the tent, dip it in sugar and eat it up. I loved rhubarb ever since those days. Thanks for this recipe, with rain forecast for the weekend I'm going to have to make a couple. Rhubarb is my favorite and my 5 plants are coming up. This looks really good Judy!! I have been longing for a rhubarb plant for some time now. Thankfully I have a few friends who will share theirs. This WILL be the year I plant rhubarb! Judy, your pie looks just like my mom's. 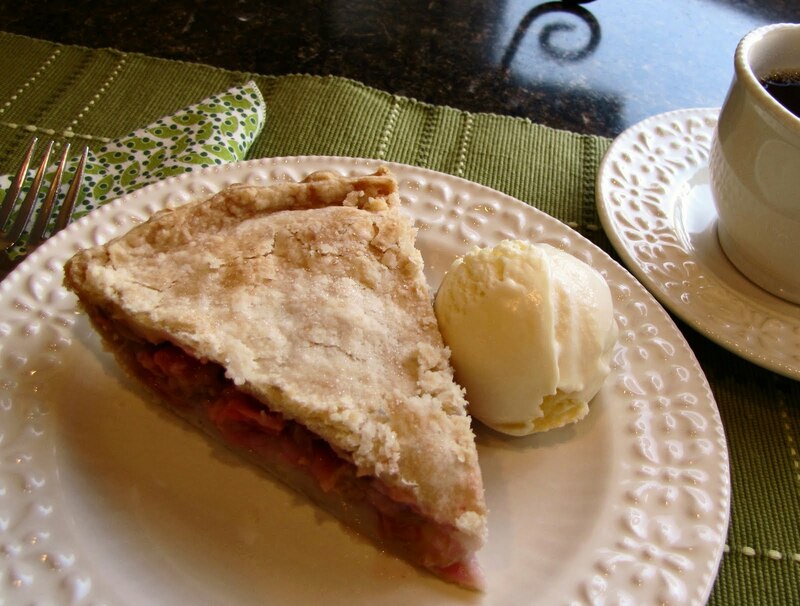 Fresh rhubarb pie..that is the best dessert of the season! I checked my rhubarb yesterday and had just enough for a cobbler. YUM! I miss rhubarb pie and rhubarb crisp. My grandmother had the best recipes. The bad part is in California I have to buy it at the grocery store. Those pictures look so yummy! I had to take time to run outside and check my rhubarb plants. I noticed that my crocuses were almost done, my tulips have buds. I saw some birds run under the evergreens. I collected some oak branches that blew down in the last couple of windy days - they will make good kindling in the fire pit. The sun is low in the sky yet still bright, and the air is sweet. But my rhubarb is only about two inches tall. The leaves look so green and fresh and full of promise. Thank you for inspiring that little spring time excursion! I just finished making it today...It was the absolute best. I took it along for company, and not a drop left.The nutmeg makes such an incredible difference. I made this pie for our dinner guests last evening and it was a smash hit! One guest asked what the fruit was and when I said rhubarb, she was astonished as she doesn't care for rhubarb, but thought it was delicious, which it was! Rhubarb is difficult to grow in our area, but I got this from a friend in Oregon when we were there in July. Thanks for sharing your mom's recipe!